Let’s call them Ann and Carl. Rolling down a California interstate, Ann detected a flat tire. Carl steered the rig off on the next exit and checked his tires. Flat tire wasn’t the word for it—anything remotely resembling rubber was wrapped around the axle and what was left of a wheel had ground a track in the pavement. The companion tire on the forward axle had been “shot through” with tire cords. In the end, a new wheel, two new tires, and brake damage took plenty of time away from the family vacation and left a considerable dent in the budget. This couple probably got off easy. The National Highway Traffic Safety Administration says tire blowouts cause more than 400 deaths and 78,000 crashes each year. Reducing those numbers is the job of a tire pressure monitoring system (TPMS). Federal law mandated TPMS in passenger vehicles sold in the U.S. since 2008. But what about your RV? There’s no mandate and it’s pretty likely your tires aren’t going bald—but they are bare in terms of this kind of protection. Many RVers are the model of efficiency when it comes to tire safety. Tire gauge at the ready, they’re first in line to check pressure before they pull out in the morning. However, things can happen. A tire monitoring system will set off a warning signal, allowing time to find a safe place to pull over before the tire blows. An aftermarket TPMS puts a pressure sensor on every wheel, each transmitting data to a dash receiver. Most sensors measure not only tire pressure, but also tire temperature – an important factor for a tire that could go critical. 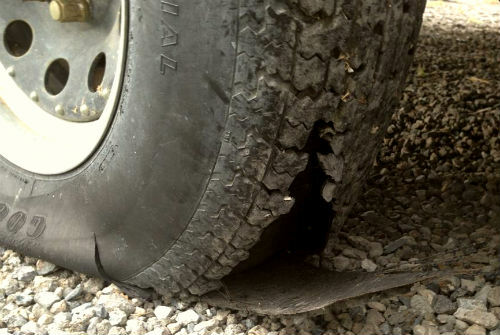 For example, a tire on your motorhome may be at a safe working pressure but could start to separate. Tread separation usually results in the dreaded “blow out,” but before that happens, tire temperature soars. A TPMS will set off a warning signal, allowing the driver time to find a safe place to pull over, inspect and replace the tire before it blows. Receiving units are “trained” to recognize each individual sensor so the driver will know exactly which tire is under-pressure or overheated. This training is generally quick and easy and only has to be done on initial installation. However, check ahead of purchase to ensure you can do-it-yourself, or ascertain the cost of programming. 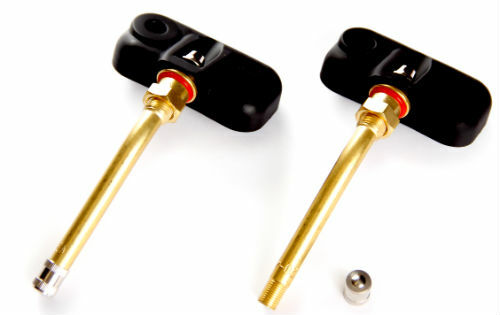 Pressure sensors can be mounted in different places. Some systems use internal sensors mounted inside the wheel (requiring the help of a tire service shop). Here the sensor is protected from damage or theft. Since most TPMS sensors utilize batteries for power, when an internal sensor battery reaches end of life, the sensor must be removed and either replaced or sent back for refurbishing. Factor in the cost of refurbishment when making a choice, and be satisfied the company you buy from will still be around when the batteries die. Buying a system from a “fly by night” outfit that puts together kits culled from parts from different manufacturers is risky. External sensors (sometimes called “flow-through sensors”) are typically user serviceable. Some come with lock systems to reduce theft risk. These screw onto the end of the tire valve. By nature of their size, the batteries in these sensors are small but aren’t expensive. Flow-through or internal system, either way, make sure the system you buy will allow for all the tires you need to monitor, including those on a toad car. As you add more sensors, the system price goes up. 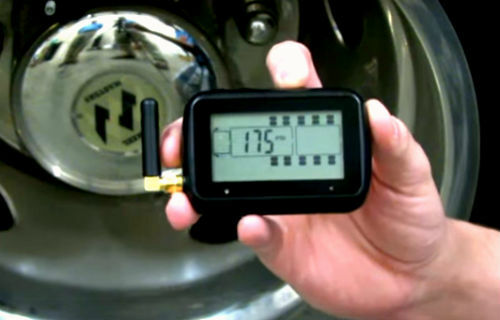 A TPMS monitor typically displays the tire pressure for each tire—and better ones indicate temperature, also. Some are battery operated and require being “plugged in” to charge. Others optionally hard-wire into the rig’s electrical system. If you’re handy and can wiggle under the dashboard, it shouldn’t be too difficult to do the hard-wire—no worries about forgetting to recharge the monitor that way. Rig size can factor into your system choice. Towables are generally a short enough combination for most systems, but large motorhomes pulling a trailer can be problematic. Signal transmission range from the tires to the receiver varies between systems. For longer combinations, you may need a repeater unit. This amplifies the signal, allowing even huge rigs like semi-trailer monitors to reach the most distant tires. The internal sensors of a tire monitoring system. How often the sensors report tire information is important. Many sensors transmit pressure and temperature information every few minutes, giving a relatively real-time report. Any system you buy should INSTANTLY report any change that exceeds safety limits, allowing you time to react before a critical failure. TST Truck Systems Technologies offers a monitoring system to fit nearly every need. Many RVers install the 507 system –transmitting both tire pressure and temperature, reporting to a handy monitor panel. It plugs into a 12-volt lighter socket or is optionally hard-wired into the vehicle. Sensors offer a choice of either owner-mounted flow-throughs, or the internal style (which have a typical battery of life of seven years). Both easily pair to the monitor in just a few minutes. Can’t recommend a TPMS highly enough. Although my tires are nearly new (put on in November on our then-just-purchased used MH and only a few hundred miles on them prior to our just-completed summer vacation) I nevertheless put on a TPMS (went with an Eeztire after analyzing all options; best price for a 10-sensor system and covers both my coach and toad without a signal booster in the back). TLDR version: it saved my bacon. Without it, I likely wouldn’t have known about the problem until I lost the tire. Full version: heading out from San Diego, I noticed some minor pressure loss on the left inside dual, compared to the other tires. Inspected the tire, saw no damage,, kept an eye on it. Lost some more pressure, aired it up in Barstow. Set screw for the TPMS sensor seemed a bit loose, so I tightened it and continue to monitor, in case that was the problem. Seemed stable, thought that was the problem. Overnighted in Vegas. Next day, problem returned. Suspected possible bad TPMS sensor. Removed sensor, aired up tire, manually checked pressure regularly. Seemed stable that day and the next morning, after overnighting in Beaver, UT. Got on the road again. Made a stop in Coalville, UT to check tire pressure. Uh-oh. Pressure on that tire was down to 80 (hot). Nominal is 100 cold. The problem wasn’t the sensor. A guy walked over from a house about 50 yards away and asked me if everything was all right. I told him I was losing air and asked him if there was a truck tire shop in the area. He gave me directions to one just 1/4 mile away, in town. At Moore’s Tire and Service. they dropped what they were doing to fix my problem, and they fixed it at a price you’d never get in California. You could hear air leaking out by the time I got there. It was my honor to give them their first-ever Yelp review. 5 stars. The tire was fine, but there was a problem with the valve stem, where it was inside the tire. He double-nutted it to make sure it wouldn’t loosen up again, An hour or so after getting there, the tire was back on and we resumed our trip. In total, we lost most of a day’s travel time from troubleshooting and dealing with the issue, including the time it took to finally get it fixed. If my TPMS had not alerted me to the problem, I would have lost far more travel time and a lot more money than the 35 bucks it cost to fix it. Even if you have new tires, don’t be without a TPMS. Extra bonus; because the TPMS also reports temperature, I noticed that my right inside dual consistently runs noticeably hotter (and therefore, at a higher pressure) than any of the other tires. I double-checked my loading, inspected the brakes, etc., but everything looked OK. While under the vehicle to inspect it, I realized the cause: the tailpipe exits right in front of the passenger-side duals, adding a lot of heat to those tires. The outside tire runs a little hotter than the others, but with the lesser air flow reaching the inside tire, it really gets hot. So much so that it was near to the 25% over-pressure default for the TPMS (125, in my case). To keep its pressure sane, I actually bled some air from that tire. As a better solution, I’ll be looking into some kind of heat shield to put between the tail pipe and the tires. Having the pipe exit behind the tires would be great, but it would be hard to get it over the rear axle and unwise to run it under the rear axle, so a heat shield is probably the best I can do. Thanks for the testimonial. We have just purchased a 2007 Endeavor and are having new tires installed. I’ve been contemplating a TPMS system…now I know that I will be getting one. I installed a TPMS on my new 41′ 5th wheel and everything was fine until I stopped to camp. The pressure on one tire was a little low, so I wanted to add 5# to it. However, the metal valve stem was very loose and actually broke the seal as air was added. I eventually figured out how to tighten the nut, but it does not appear to have enough threads to double nut it. I checked the rest of the wheels and they all had the same problem! I was afraid the TPMS pass through sensors had put a load on the stems causing the nuts to work loose. Has anyone else had this problem? I have new metal stems now. The rubber seals on the stem inside the wheel seem beefier, but I haven’t put the sensors back on yet. The problem with mine sounds like what you describe – the valve stem seal inside the tire was out of place, causing air to leak past the valve stem. Since this only happened on that one tire, but all six have pass-through sensors, I tend not to think the sensor was the problem, since that didn’t happen on any of the other tires, and the valve stem extenders for my inside duals are straight (and steel). Thus, there’s no significant centrifugal force acting on the valve stem from adding the sensor. The front outer duals have 90-degree bends in the valve stems, and neither of them has had a problem, nor has the other inner dual. It may have been just bad luck, or it may have been not installed properly and just worked loose over time. That happened early in only my second trip since getting the tires put on, and the tires had fewer than 500 miles on them before the problem started to happen. If it were caused by the sensor, I would expect the same problem to happen on other tires, but I drove about 2,500 miles after it was fixed, with no problems at all. The biggest problem with RV tires is MAINTENANCE! RV’s tend to sit for long periods and the tread depth is good so people don’t think they need to be replaced. Fact is a tire that sits frequently has a shorter life span than one that is driven daily. On my RV;s , regardless of the tread on the tire, tires ALL get replaced every 5 years, PERIOD. Sooner if they show signs of checking (cracking). The 2nd biggest factor is under inflation. An under-inflated tire will build up more heat than a properly inflated tire. Heat causes the tire compounds to break down and ultimately lead to failure. Make sure you inflate tires to the MAXIMUM pressure recommended on the tire. For the last 40 years I have inflated them 10# over spec and found they wear and handle much better. Of course a properly inflated tire will cause less drag and you will also maximize your fuel economy. Every 5 years when I change out my tires, I also have brakes checked/replaced and wheel bearings re-packed. Lastly, if your RV is parked for long periods out doors, cover your wheels to keep direct sunlight off. Sounds like the “article” is more of a sales pitch for an expensive monitoring system as it ignores maintenance. We use the TPS system on semis and it is a good system although longevity could use some improvement. While a TPS can help you avoid a bigger problem going down the road if you pick up a nail, catestrophic tire failure is typically maintenance related. Thanks for your input. You can read about tire maintenance at an article we did a few months ago. 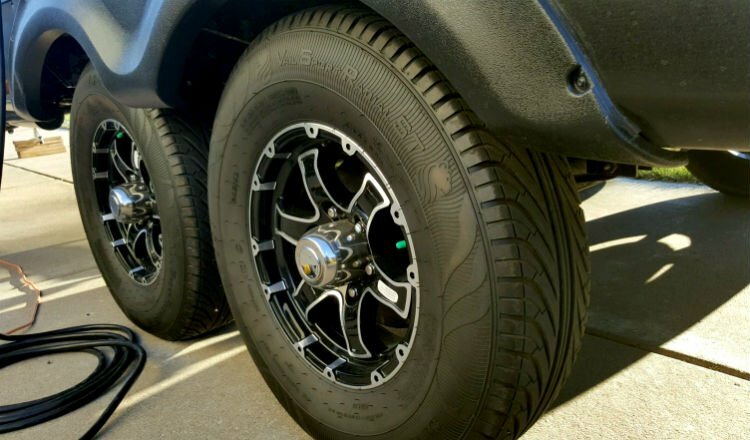 You can visit http://rvlife.com/top-tips-to-maintain-your-rv-tires-this-season/ for the details. I think these are a good idea, but also that they are dramatically over priced, just like so many things for RV use. AMEN! We have also found them to be tempermental and customer service is inconsistent at best. I guess it depends on how you define overpriced. My 10-sensor Eeztire (6 flow-through, 4 anti-theft) was $440, shipped. A Toyo tire for my MH is about $300 (locally in San Diego, probably more in an on-the-road-gotta-have-one-now situation), plus mounting and balancing, tax, and maybe an environmental fee. Close to $400, when all is said and done. I have new tires (less than a year old, and only a few hundred miles on them before my major vacation this summer) and my TPMS (put on right before the trip) saved me from a tire failure caused by a valve-stem problem (new stems, but it’s inner seal was leaking). If you only consider the cost of a tire, my TPMS has already nearly paid for itself. If I factor in what-ifs such as losing the rim (a common occurrence), damage to the coach from pieces of tire flying off, extended loss of travel time waiting for a new tire and maybe rim, or in the worst case, and accident and death or injury to anyone, I’m way ahead of the game from having a TPMS. Since the tire that was saved from failure is an inside dual, being in a wreck if it failed is highly unlikely, but the chances of that go up a lot if it’s a front tire. Chances of damage to the underside of the vehicle and loss of the rim go way up, however, because it’s hard to feel anything wrong with a rear tire. I’m counting intangibles in my calculation, though, so my view is that the TPMS saved me a tire and a rim, labor to put them on, and maybe a towing bill. Just based on the tire, rim, and labor, I’m money ahead on the TPMS. Performance of the system has not been rock solid under all road and weather conditions, too. I have a 36-foot MH and tow a minivan; initial setup was easy, and the sensors on the minivan never lost contact with the receiver – no booster required. I can’t comment on Eeztire’s customer service, since my only contact was ordering the system, but they seem to have a good reputation. That was one of the reasons I chose their system. I have tpms on all tires on my toad, a Jeep that I tow all down. Can I add tpms to the tires on my toad? I’d like to monitor them from the RV. I tow a 5th wheel. My TPMS is on those wheels, my RAM has its own TPMS built in. From what I read prior to buying my system, you are able to add additional monitors for other tires/vehicles. For me, the price is worth the peace of mind. It costs about the price of a new tire. I travel alone, I don’t want problems. Yes, you can. I have TPMS sensors on both my toad and motorhome (10 in total; my system will take up to 22 sensors). Monitoring the toad is very important, because if you get a flat on your toad, it’s unlikely you’d feel it. The first indication that anything is wrong might be when the tire has completely come off the rim and things start getting shaky back there and you see the toad acting funny in your review monitor. Or worse, you notice smoke and flames. Having this technology is probably a really good idea but, how many of your readers know what to do when a “blowout” does occur? There are so many out there that don’t know this simple solution, I try to promote it everywhere I go. I wrote a recent blog about it on our safety site. Please spread this knowledge freely as those who learn from it may be the driver coming toward you. I have already seen a video on the subject with the same advice, but it never hurts to restate and remind us what to do. Thanks for the reply! Just came back from a 6 week trip out west, Custer, Yellowstone, Glacier. Bought new tires and the TST system prior to leaving. Didn’t want to headache with reading the directions so I just called them. They walked me through the entire setup process over the phone and were glad to help. One of our RVing couples had two blowouts on their fifth wheel in the months prior causing thousands of dollars of damage and down time trying to patch the fifth wheel back together so they could limp back home I wanted the piece of mind for our trip. It is nice to be able to monitor tire pressure and temperature while traveling. There was a 2 pound difference between the TST pressure and my tire gauge first thing in the morning ( so I just split the difference). Not sure which was off as I haven’t checked it against another tire gauge. The unit for the dash will go several days ( 3 -4 traveling 8 hours per day ) without needing to be recharged. I went with the external sensors and upgraded the valve stems to metal as recommended on their website. I highly recommend the product. I have the TST system illustrated in the blog and found it to be exceptional but for one problem. The charging cord socket on the display monitor is poorly designed and makes very poor contact making it impossible to recharge while driving. To charge I must do so while not moving and then prop it up so that the plug hits the “sweet spot” in the socket. To give TST credit, I called them a couple of years ago and they sent me a new monitor. Unfortunately it has the same problem and I haven’t called them back. Other than that, I have used it for over 25,000 miles over 4 years including a trip from Arizona to Alaska and back. I swear by my TPMS! Most St tires are JUNK. Put the $300 – $500 for the TPMS toward some real good LT tires and be done with it. A TPMS only confirms what you already know: “I’ve got a blown tire” Having been through this once, they go with a large bang which we heard. Pull over slowly with very little braking and change it out. Also every stop feel all the tires and rims for the SAME relative temperature. Good luck! A TPMS most certainly does not only tell you what you already know. Most blowouts do not arrive without warning. Against the ones that do, yes, nothing can protect you. However, most blowouts are preceded by an increase in tire temperature and/or loss of pressure in the tire. The TPMS continually updates that data and gives you a chance to spot a small problem and take care of it before it becomes a big problem. When I had a valve stem start leaking on one of my inner duals, that would have become a big problem. Instead, because my TPMS let me know about it, I got off the highway, confirmed its reading with a tire pressure gauge, found the nearest truck tire shop, aired the tire back up to where it should be, and went to the shop and got it fixed. Without my TPMS, I would have learned about the problem the hard way. It was early in the driving day, the tire pressure was fine when I set out, and it would have been hours before I stopped for fuel. Yes, everyone should have good tires. Yes, everyone should have a quality pressure gauge and should perform manual checks. I also think everyone should have a TPMS. I won’t go without one. Incidentally, that TPMS was brand new at the time, it was my first trip with it. It really saved my bacon.